Have you heard of Scentsy? Scentsy warmers use a "plug in and turn on" system to warm a low-watt bulb that slowly melts a specially formulated wax, maximizing the fragrance time of the Scentsy Bar. 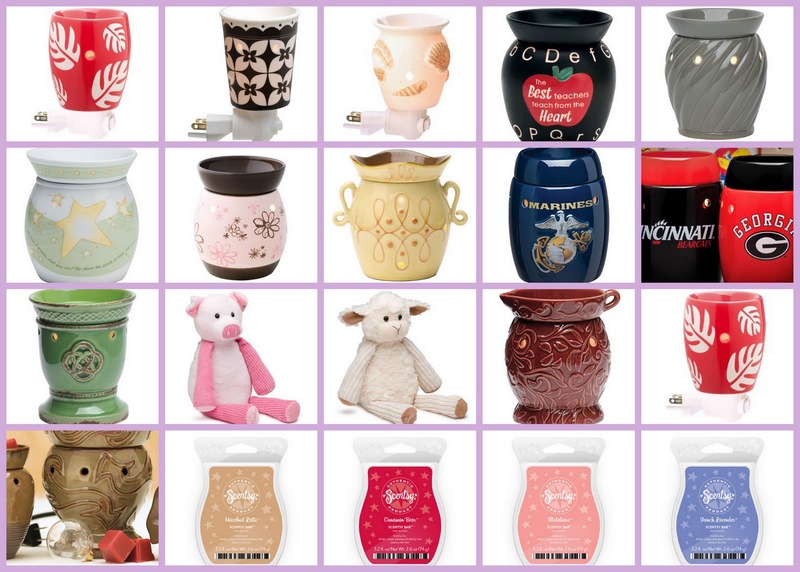 With no flame, soot or wick, the Scentsy system is a safe way to enjoy more than 80 Scentsy fragrances! As you can see from the photo collage I made above of a few Scentsy products, there are a variety of ceramic warmers available in many different styles and sizes, from small wall plugs-ins, and mid size and and full size warmers that have electrical cords with an on and off switch. There are many different designs of warmers to choose from, many sizes, shapes and colors. There are even some that have the insignias of many different college teams, and there are ones for the four branches of the military. During the holidays a special holiday themed warmer is usually released and you can see the green Celtic Love Knot design warmer for the upcoming Saint Patrick's Day above, in the middle row, extreme left. Scentsy even sells an assortment of soft and cuddly "Scentsy Buddies" that will add a pleasant scent to your child's room with a non heat scent disc that is inserted inside a zippered compartment. You can browse the Scentsy catalog online at this link or this one. I love the Scentsy warmers I own, and I enjoyed scenting my home this winter with wonderful scents such as French Lavender, Cranberry Spice, Cozy Fireside, Cinnamon Bear, Blueberry Cheesecake, Lush Gardenia, and Hazelnut Latte. Just a few melted squares of wax from the bar made a room smell wonderful ! My Scentsy Consultant has informed me that the upcoming Spring Scentsy bars will be amazing and can fill your home with the most delicious and glorious scents! 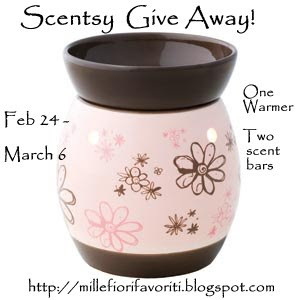 To help bring the scent of SPRING to a lucky reader I am giving away one Scentsy warmer of your choice, either mid size or full size, and two scented wax bars of your choice, or a Scentsy Buddy of your choice, and a scent "pak" of your choice! All you have to do is leave a comment telling me what one of your favorite scents is for one chance. If you become a blog follower, or are already a follower, just leave another separate comment telling me so for a second chance. If you put the graphic below on your blog sidebar and link it to this post you will get a third chance - please let me know you've done this in another comment. You don't have to have a blog to enter, but please leave your e-mail address in your comment so that I can get in touch with you in case you win. I will use the Random.org web site to chose a random number winner from all the entries I receive. The morning of March 7 I will announce the winner on my blog. Good luck! You will enjoy having this delightful way to scent you home! * Comments closed -- winner chosen today by RandomGenerator.org ! See March 6 th's post amended on March 7th for the winner's name. Thank you all who entered my give away -- I will be happy to do this again sometime soon, so please keep checking back! When my husband I traveled back from visiting the Yellowstone National Park, and The Grand Teton National Park on a trip to the state of Wyoming, we drove along The Snowy Range Road, which is highway 130. It connects Laramie to the Upper Platte River Valley. Begun in 1920, it took 6 years to complete and was called the "Great Skyroad." It was designated the Second National Forest Scenic Byway in the United States. An informational placard at a rest stop along The Snowy Range Scenic Byway which passes through the heart of the Medicine Bow National Forest and is peppered with crystal blue lakes and jagged gray granite peaks. The Medicine Bow Mountains are a mountain range in the Rocky Mountains that extend for 100-miles from northern Colorado into southern Wyoming. Wyoming's northern portion of the range is often referred to as The Snowy Range. The views of Snowy range Mountains is breathtakingly beautiful! I was amazed by the large numbers of enormous boulders and stones that were scattered on both sides of the road way and on the valley floor, the result of glacier movement over the ages. The grey mountain peaks are composed of Sherman Granite that dates back nearly 1.5 billion years. Due to the grandeur of these rock formations, many Native American people once revered this place as sacred. We stopped at the Libby Flats Observation Point where we saw other visitors who were also viewing the beautiful scenery. Although the Libby Flats Observation Tower was only a few feet high, it was located at an elevation of 10,885 feet, and the town of Laramie, approximately 40 miles distant, was visible as were various lakes and mountain ranges. Our view for the tower looking south toward Colorado. With high power binoculars one could see Pike's Peak in the distance! A sunny cup of coffee latte I had in a cafe in Laramie, Wyoming. It's a beautiful country, and the Western part of the USA holds views that never cease to amaze and delight this East coast New York City girl! Please come back Friday as I will have a special spring give away on my blog! Linking this post to Susan blog's A Southern Daydreamer"Outdoor Wednesday" event. Thanks Susan! For this President's Day holiday I thought it would be nice to show a special memorial dedicated to the sixteenth president of the United States, Abraham Lincoln. This memorial was made to commemorate Lincoln's150th birthday and is located on a section of Interstate Highway 80 in the state of Wyoming. My husband and I traveled on I-80, that is also know as the Lincoln Highway, during a trip we took to the beautiful state of Wyoming to see Yellowstone National Park, among other sights. (Click on this link "Wyoming" to see more about this trip). The original Lincoln Highway was the first transcontinental 3,500 mile automobile route to connect New York City with San Francisco, California. Much of the original Lincoln Highway evolved into US 30 in the 1920's and Interstate 80 in the 1950's. The entire history of the Lincoln Highway can be read on this Federal Highway history link. You can double click to enlarge the photo above to read about Henry Bourne Joy, the first present of the Lincoln Highway association in1913. Joy, also president of the Packard Motor Car Company, is sometimes called the father of the nation’s modern highway system. Joy said that his effort to create the Lincoln Highway was his greatest accomplishment. 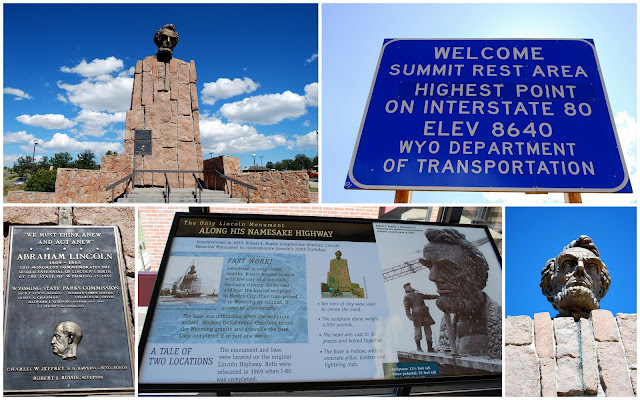 The Lincoln Highway Historic Monument lies 10 miles SE of Laramie, on exit 323 on Interstate 80 at the edge of Summit Rest Area. It marks the highest point on Interstate 80, with an elevation of 8,640 feet. This historic monument was designed and created in 1959 by Robert Russin, who was an art professor at the University of Wyoming. The bronze bust of Lincoln's head is thirteen-and-a-half feet tall on top of a thirty five foot tall base, composed of Wyoming granite. The head of Lincoln was cast in 30 pieces and is bolted together much like the inside of the Statue of Liberty. It is the only monument to Abraham Lincoln along the Lincoln Highway and is the largest bronze head sculpture of him in the U.S. Originally the Lincoln Memorial Monument was located about a half mile west at Sherman Hill on the original Lincoln Highway, but was moved to this location in 1969 when Interstate 80 opened. Taking a road trip in Wyoming was a thrilling experience for my husband and I as we passed the most spectacular scenery along the way. Come back Wednesday and I'll show you a magnificent view of the Snowy Range of the Medicine Bow Mountains. Linking to "Mosaic Monday" on Mary's blog Little Red House, "Blue Monday" on the Smiling Sally blog, and My World Tuesday hosted by Klaus, and the My World team. Thanks to all for hosting such nice events for us to join every week! Are you an oyster lover? Oysters are bivalve mollusks which live and found in fresh or salt water. Filter-feeders, they are notably high in protein, low in calories, and are excellent sources of several minerals, including iron, zinc, calcium and selenium and a good source of vitamin B 12 and vitamin A. Preparation of oysters widely varies, as they can be eaten on the half shell, raw, smoked, boiled, baked, fried, roasted, stewed, canned, pickled, steamed, broiled, or used in a variety of drinks. My favorite way to eat oysters is raw on the half shell served cold on a bed of ice. Sometimes I top each oyster with a little freshly squeezed lemon juice or I add a bit of ground horseradish or cocktail sauce. I relish them, as they are a delicious taste of the sea! I just finished reading this excellent book that follows the history of New York City and the renowned oyster beds in the Hudson River estuary. "Before New York City was the Big Apple, it could have been called the Big Oyster." 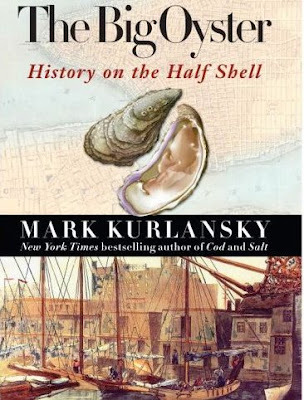 according to Mark Kurlansky, author of the 2006 book The Big Oyster: History on the Half Shell. As Kurlansky states in his book: "For centuries New York was famous for its oysters, which until the early 1900's played such a dominant a role in the city's economy, gastronomy, and ecology that the abundant bivalves were Gotham's most celebrated export, a staple food for the wealthy, the poor, and tourists alike, and the primary natural defense against pollution for the city's congested waterways." Kurlansky, who is also the best selling author of "Salt: A World History," and "Cod: A Biography of the Fish That Changed the World," writes in a wonderfully narrative, rambling, factual style that made me feel like I was auditing a university culinary history lecture. He includes historic recipes, maps, drawings and photos among the pages of the book so the reader is totally immersed in oyster lore and facts. He is such a good teacher that I wanted to learn more, and did some of my own research. Oysters were extremely plentiful during the early history of New York City, and many were as large as dinner plates, as depicted in the illustration above. The estuary of the lower Hudson had 350 square miles of oyster beds that for centuries fed the Lenape Native Americans, the Dutch settlers, the English, and the Americans after the Revolution. They were a staple of their diet and New York's major export. New Yorkers rich and poor were eating them in oyster cellars, saloons, stands, houses, cafes and restaurants. In some places oysters were sold as an "all you can eat" item for six cents. In 1860, some 12 million oysters were sold in New York markets; by 1880 the area's oyster beds were producing 700 million a year. Oyster Houses, South Street and Pike Slip, Manhattan. April 01, 1937 -- notice the piles of discarded oyster shells in front of the buildings. As the population of New York climbed, the constant discharge of garbage and sewage began to take a toll on the harbor floor. Outbreaks of cholera and typhoid from the apparent consumption of infected oysters began to occur and in 1927 the city's last oyster beds closed and purveyors switched to cleaner oyster sources. The most common variety of oyster in the United States today is the Blue Point Eastern Oyster, which measures 2 to 5 inches across and can be found from the Gulf of Mexico to Prince Edward Island. They also have regional names: Apalachicola (Florida), Bluepoint (New York), Breton (Louisiana), Chincoteague (Virginia), Malpeque (Canada), and Wellfleet (Cape Cod). Because oysters, or any raw fish or shellfish, may contain harmful bacteria, which mainly comes from unregulated waters, pregnant woman or those with compromised immune systems should avoid eating them. One of the historical subjects in "The Big Oyster" book that I found fascinating was the history of the Delmonico family and the Delmonico's Restaurant, the first of which was located at 56 Beaver Street in lower Manhattan. The restaurant's website states: "Delmonico's, opened in 1837 as America's first fine dining restaurant, continues to serve the connoisseur of fine American food in its premier location at 56 Beaver Street, the heart of Manhattan's financial district. Birthplace of the Delmonico Steak, Delmonico Potatoes, Eggs Benedict, Lobster Newburg, and Baked Alaska, the original Delmonico's offered unheard of luxury - the availability of private dining rooms, an extensive wine cellar, innovative cuisine, and, above all, warm, personal service." The first building burned down in a fire and the present building seen in my photo above, replaced it in 1891. Many famous people ate at this establishment, including Queen Victoria and her eldest son, the Prince of Wales, Charles Dickens,Theodore Roosevelt, Mark Twain, Oscar Wilde, Diamond Jim Brady, Lillian Russell, J. P. Morgan, William Makepeace Thackeray. Samuel F.B. Morse sent the first transatlantic cable from a dining room. An extensive history of the restaurant can be read at the Steak Perfection website. A collage of photos from the restaurant's web site, which includes a 20 ounce prime rib-eye steak, grilled to perfection and topped with herbed butter, which is a signature dish that's the gold standard for all steak houses try to achieve. 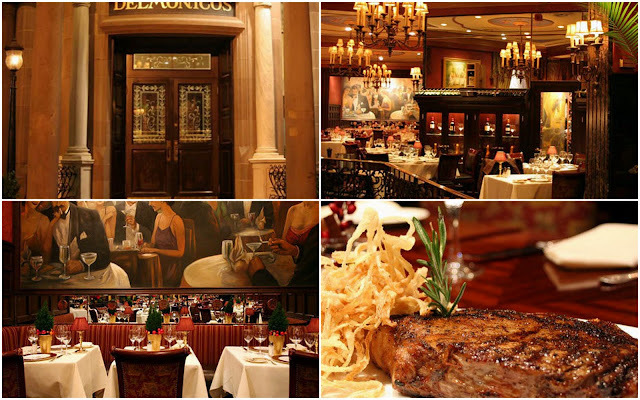 The restaurant has changed ownership many time over the years, but it still retains the Delmonic's name and many of the signature dishes that have been a part of the Delmonico tradition since its early days. A video on how to open a live oyster by a chef instructor, Gerard Viverito, of the Culinary Institute in New Hyde Park, New York. For a truly elegant way to serve oysters try a mignonette sauce and caviar. The following recipe is adapted from The Culinary Institute of America's "Garde Manger, The Art and Craft of the Cold Kitchen." 1. In a medium sized bowl, combine the shallots, chives, vinegar, and pepper and reserve. 2. Shuck the oysters, loosen muscle from bottom shell, then remove oyster with top shell. 3. Place the oysters in their shells on a bed of crushed ice. Top each with mignonette sauce and a dollop of caviar. 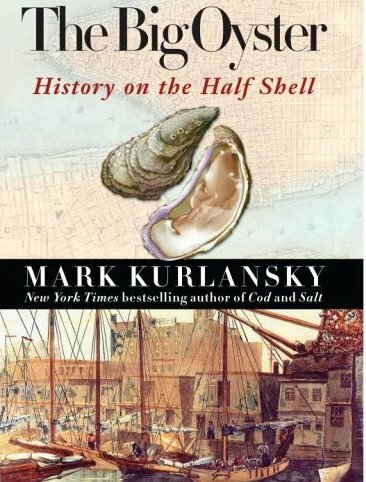 No matter if you are an oyster connoisseur, or a history buff, you will find reading "The Big Oyster: History on the Half Shell" both entertaining and delicious! I'm linking this post to Jenny Matlock's Alphabe Thursday for this week's letter "S" for oyster's found in the Sea that taste so good Slurped right off the Shell! This is also an Edible Book Review inspired by Jain at Food for Thought, a delicious blog for readers with an appetite for the written word. I will also be linking with Mary of the blog Home Is Where The Boat Is who is hosting a "Cook Your Book and Join In The Fun" event March 1st -- I give The Big Oyster: History on the Half Shell **** for "good read!" Thank you all for your inspiration! Please visit all these wonderful blogs and join in on all the fun! I will be choosing the winner of my "One World, One Heart" give away tomorrow, February 17, 2011. Please check the original post on this link to see the winner. Thank you to all who entered! It was so nice meeting so many wonderfully creative bloggers! The somewhat grainy photo on the left is of a time long ago when I was not yet twenty years old, on a wonderful school trip to Italy. I am standing on the veranda of the Palazzo Borromeo on Isola Bella. I always had a bit of wanderlust in my blood even though my family rarely left our home in Brooklyn, New York. About the only place we visited regularly was my maternal grandmother's home in rural Pennsylvania, and I'm sure my love for the country and old fashioned farm life came from those wonderful visits. But the desire to travel always burned bright in me and when I heard that my high school sponsored a two week trip to Italy every spring, I worked very hard to save my earnings from various part time jobs to be able to go in my senior year. This was the trip of a lifetime, and now that I am in my silver years I look back fondly at the experience, ever happy that I took the chance to go! I bought many postcards on that trip as I was afraid my little Kodak instamatic camera would not capture the beauty before me. 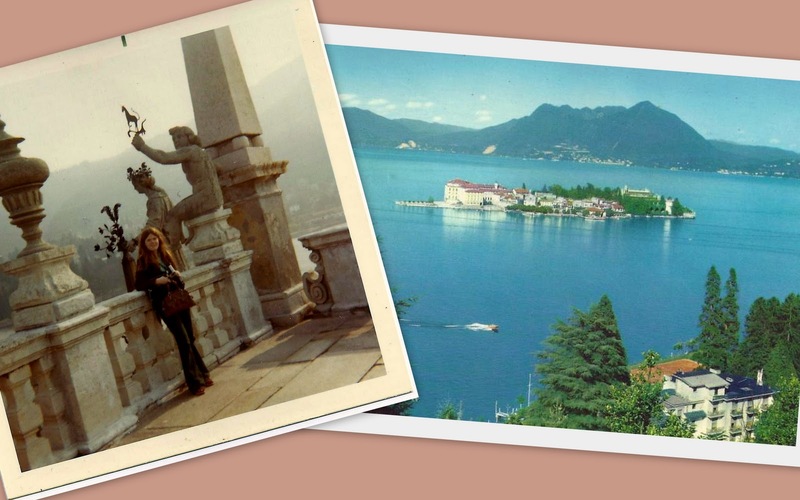 The photo on the right is showing Isola Bella, one of the Borromean Islands of Lake Maggiore in the Piedmont region of northern Italy. In 1632 Carlo III of the influential House of Borromeo began the construction of a palazzo dedicated to his wife, Isabella D'Adda, from whom the island takes its name. Isn't that a testimony to love? The island achieved its highest level of social success during the period of Gilberto Borremeo (1751–1837) when guests included Napoleaon and his wife Josephine. My circa 1970's photo of the legendary Juliet's balcony at Villa Capuleti in Verona is on the left. The balcony scene in Shakespeare's play Romeo and Juliet, which was about young star crossed lovers of long ago whose tragic deaths are said to have ended a violent and long-standing war between two powerful families, supposedly took place here. 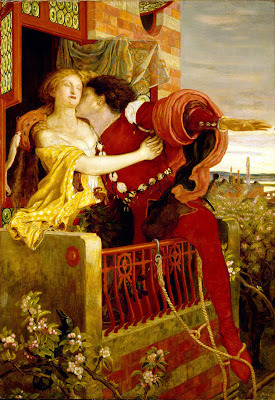 The first accounts of Romeo and Juliet was in a "novella" by Luigi Da Porto (1531). He was a captain in the service of the Venetian Republic and he claimed that one of his bowmen, named Pellegrino da Verona, told him the true story of two unfortunate young lovers who had lived at the beginning of the 14th century and belonged to two rival families, the Capulets and the Montagues. This novel inspired a lot of other European writers, until it reached the peak of artistic expression in Shakespeare's "Romeo and Juliet," written in 1596. A clearer postcard view of the same balcony from the 1970's is on the right. If you were to visit this courtyard today you would find a bronze statue of Juliet, large amounts of tourists, informational signs about the legend and many letters and notes attached to the walls from present day star crossed lovers who are asking Juliet for help. 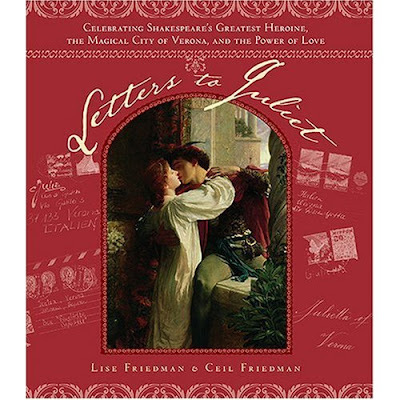 The letters are typically answered by the "secretaries of Juliet," who are volunteers from Verona who for more than 70 years have collected the notes and the letters that arrive in the mail by the thousands, and then write back to every single letter writer who gives an address! Although I found the movie somewhat contrived and sappily sweet, it is certainly a fun movie to watch for Valentine's Day. You can easily find it on DVD. It's a delightful movie to watch for all its beautiful scenes of Italy and also to see the stately beauty of Vanessa Redgrave. If I can age as gracefully as she has, I would be a deliriously happy woman! In reality a group of about 15 secretaries, the Club di Giulietta (link is to the English version), divides up according to their languages and romantic problems, the more than 5,000 written letters that also pour by mail into Verona, and answer them. Secretaries have been doing this since about 1940, when one of the caretakers of Juliet's house and tomb began answering the notes and letters that had been piling up for years. They even award a "Cara Giulietta" ("Dear Juliet") prize on Valentine´s Day to the most compelling letters received during the previous year. You can also look for a copy of the Letters to Juliet book, which has nothing to do with the movie, but is also a charming story about these letters and the Juliet Club volunteers. 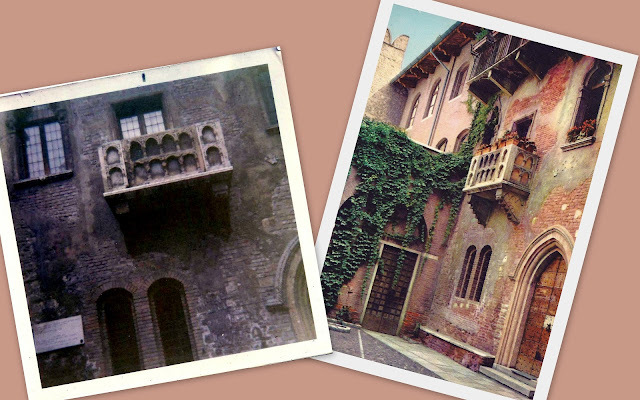 I'm sure you'd like to know if I left a letter for Juliet when I visited Verona so many years ago? Thankfully I didn't have to, as I met my future native born Italian husband two years later. But I did imagine him, and asked "the powers that be" to help me meet him at another very special and magical place.....and it wasn't even in Italy.....but that, as they say, is a story for a future blog post! 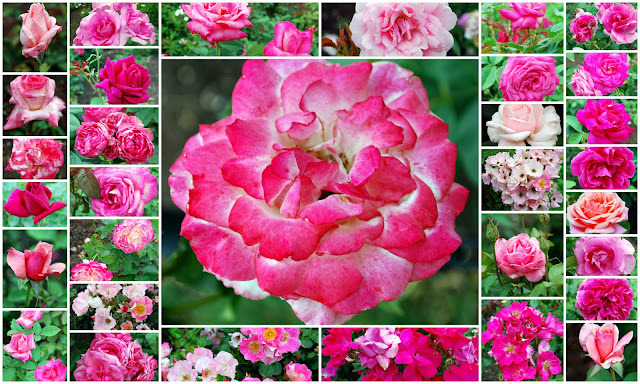 I'm linking this post to "Coast to Coast, The Colors" of Love at Candy's The Little Round Table, "Friday's Favorite Linky Party" on Sandi's blog Whistlestop Cafe Cooking, "Pink Saturday" on Beverly's blog "How Sweet the Sound," Laurie's "Valentine Party" on her blog Chatting and Bargain Hunting with Laurie, Mary's "Mosaic Monday" on her blog Dear Little Red House, and "Rednesday" at Sue's It's a Very Cherry World. Thank you all for your hospitality! A week ago I showed this photo of a car in this post completely buried under snow on a street in Brooklyn, New York, in January after snowstorms that we had here this winter. .....and this is from the rear of the car. Quite a few readers asked me to follow up and see what happens to thsi car as the winter progresses. Quite a few readers were also wondering if the owner of this car was being ticketed, as they knew that most areas of New York City has "alternate side of the street" parking laws to allow street sweeper vehicles to come along and clean the streets. This area of Brooklyn is very residential and does not have those laws, as the homeowners themselves are required to clean the streets in front of their homes. Plus, even if the laws were in effect, they were suspended many weeks by the city because of all the snow deposits along the curbs. They were reinstated this week and I heard that the city did write many tickets on Monday for cars that were not moved. You can see from this photo how much snow remains on the streets, even though New York City has not had a significant snow storm in the past few weeks. This pile of snow that was surrounding a car even contained a discarded Christmas tree that the department of sanitation has not yet picked up! A lot of wind blown garbage has also begun to collect in the hardened, icy, snow piles. Another street piled with snow! The leftover snow is not a pretty sight and it has been a major inconvienience for many this winter. My guess is that most of the owners of these cars have been using mass transit to get to work and do shopping, etc. Their carsicles have not been useful to them since the big blizzard that occured the day after Christmas! When spring thaw finally comes to Brooklyn it will be a welcome sight and much clean up will be needed. This is certainly turning into a winter we will not soon forget! 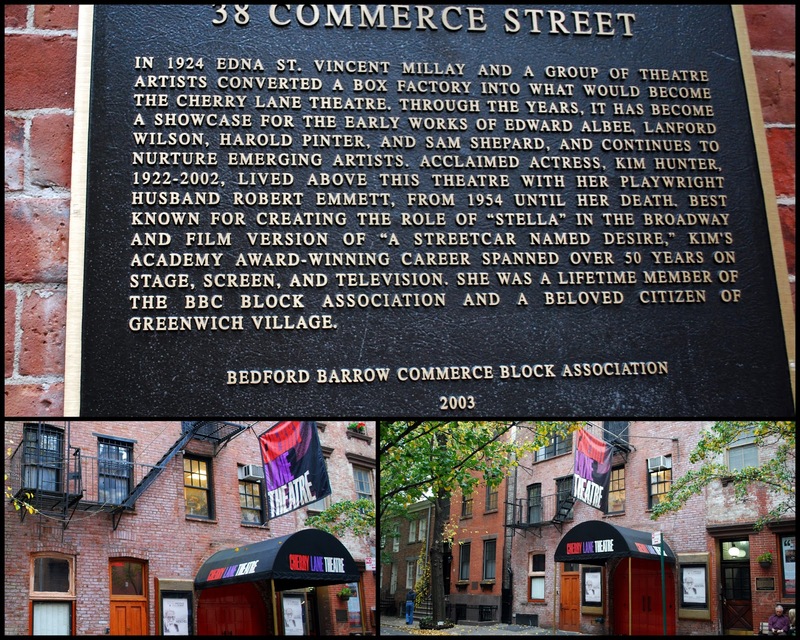 Next, we see The Cherry Lane Theatre, located at 38 Commerce Street. As you can read on the historical plaque on the top of this photo collage, this threatre has an illustrious history as New York's oldest, continuously running Off-Broadway theatre. Playhouse productions featured an equally illustrious group of actors and directors, including John Malkovich, Barbra Streisand, Geraldine Fitzgerald, James Earl Jones, Tony Curtis, Ruby Dee, Gene Hackman, Bea Arthur (making her stage debut), Burl Ives, Bob Dylan, Kevin Bacon, Kim Stanley, Frank Langella, Tyne Daly, John Epperson, Nancy Marchand, Robert Loggia, Dennis Quaid, Joan Cusack, among others. I saw the play Nunsense here, years ago with friends, and the 25 anniversary revival of this hilarious production is scheduled for this summer. Gay Street extends from Christopher Street one block south to Waverly Place, between and roughly parallel to Sixth and Seventh Aves. It was named after an early landowner from the late 1700's. This charming, slightly bent street began as a street lined with horse stables for the wealthy. It then became low class housing for their servants. By the turn of the 20th century it developed into a mini-haven for artists and writers. Gay Street was the setting for Ruth McKenney's novel "My Sister Eileen," and the film "Carlito's Way." The address 12 Gay Street, the building with the blue shutters seen in the bottom middle of the photo collage above, was originally built in 1827 and was formerly a speakeasy called Pirate's Den. The property was later converted into a three-story residence for former New York City Mayor, Jimmy Walker. Later, it was home to puppeteer Frank Paris, designer of the original Howdy Doody marionette. It is also reportedly haunted. The plaque above describes the Greek Revival homes in the adjacent photo. Many examples of preserved "old New York" can be found in Greenwich Village. 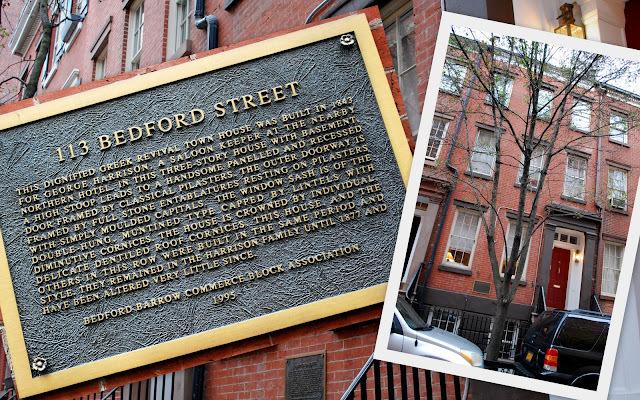 This beautiful edifice on 95 Bedford Street, marks the former home of J. Goebal & Co., a factory that produced crucibles--containers for holding molten glass--founded in 1865. Notice the three glasses in the edifice design. Built in 1831, the Northern Dispensary is the only building in New York City with one side on two streets, Christopher and Grove Steets, and two sides on one street, Waverly Place. The property was used as a clinic to provide medical care to the “worthy poor.” Poet Edgar Allen Poe was treated here for an illness in 1837. 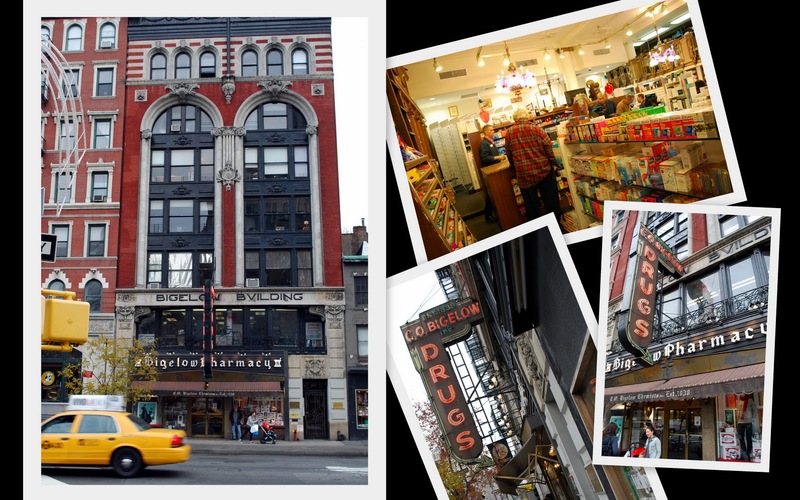 Sadly, this remarkable building has been unoccupied for about 15 years when real estate investor William Gottlieb purchased it. He passed away in 1999 and his heirs have declined to do anything with the building. You can read more about this building on this link. Ye Waverly Inn located at 16 Bank Street at Waverly Place, has been a landmark in New York’s Greenwich Village since the 1920’s. In 2006, Vanity Fair editor Graydon Carter bought and refurbished the restaurant, and made it into one of the most sought after places to dine in New York City, although the food critic at New York Magazine does not give it high ratings in his review. Of course it helps that the restaurant has its own blog on the Vanity Fair Magazine web site to keep the hype going, and although reservations are currently handled only via a private number, it is reportedly full every night. According to the New York Times: "On any given evening the restaurant plays host to some combination of billionaires, movie stars, intellectuals and fashion designers, with a rock icon or sports legend thrown in." I couldn't resist taking a photo of this interesting graffiti on a red door! 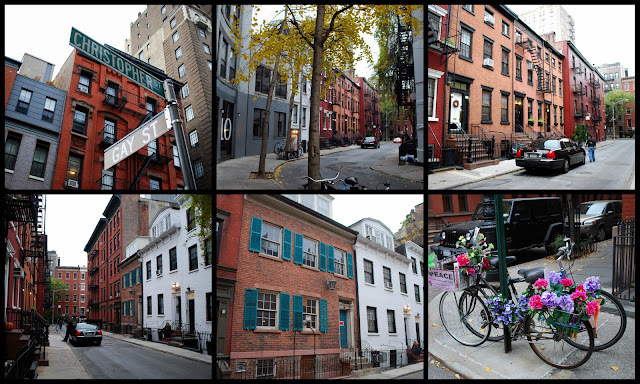 Greenwich Village is a fascinating place to visit, always full of new discoveries. Be sure to take the time to do your own stroll around if you ever visit New York. 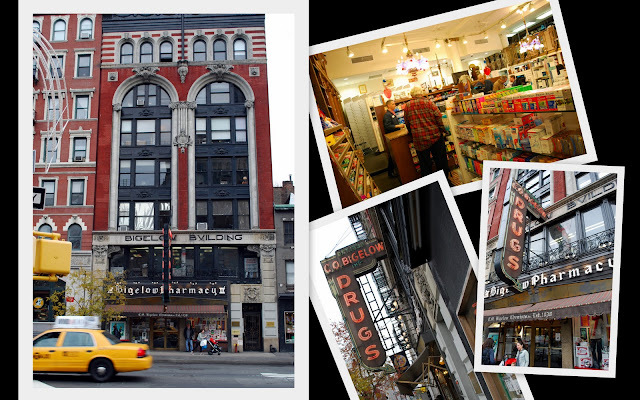 If you'd like to see more I have quite a few more posts about this area of Manhattan in my blog's Greenwich Village labels and also my East Village labels. Linking to Mosaic Monday on Mary's blog My Little Red House and My World Tuesday hosted by Klaus, and the My World team. Thanks to all for hosting such nice events for us to join every week!